There is a great opportunity in Bristol to visit places of interest, go on a shopping spree or eat out in one of the many varied eateries Bristol has to offer. 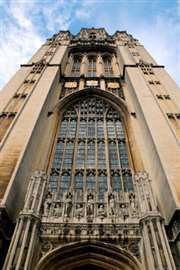 With the history of Bristol reaching back to Norman times and its position as a port and major manufacturing area, it’s no wonder the city is of important historical interest. You’ll need a good few days to visit all the major sites but even if you only have one day there is bound to be something of interest. There are plenty of places to stay in Bristol suiting all budgets including hotels and bed and breakfast establishments. The influence of the engineer Isambard Kingdom Brunel, Bristol’s position as a major port and the effects of the Industrial Revolution are to be seen all around. 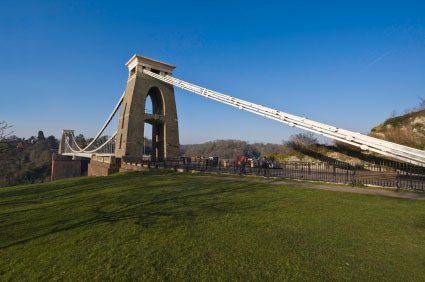 Visit the SS Great Britain, Bristol Industrial Museum and Brunel’s Clifton Suspension Bridge or travel further back in time to Bristol Cathedral, parts of which date to the Norman period. Add a splash of culture and take a short trip to the Bristol City Museum and Art Gallery, Blaise Castle House Museum in Henbury or Red Lodge. If you are taken to natural history why not visit Bristol Zoo Gardens or St. Westburgh’s City Farm. You are spoilt for choice in the South West’s premier shopping centre. The Broadmead Shopping Centre offers over 400 shops, including department stores, eateries and pubs. Specialist and independent shops can be visited at Christmas Steps (at the top of which is the Chapel of the Three Kings), Park Street and Clifton Village to the east of Bristol. From John Wesley’s Chapel at Broadmead, a walk up Union Street and along Corn Street (visit the Commercial Rooms here too) will take you past a number of historic sites such as the Council House, Corn Exchange (where there is a covered market), the Grand Hotel built in 1869 and the Guild Hall with its Art Nouveau frontage completed in 1843. On this route to the Harbourside there are plenty of other interesting places to visit including one of the oldest operational theatres in England – The Theatre Royal which was built in 1766 and Rowes Leadworks. The coat of arms shows a three masted ship and castle flying the cross of St. George supported by 2 unicorns with motto: Virtute et Industria - By Virtue and Industry. If you are planning a wedding in the Bristol area, try checking out Bristol Wedding Fairs. At the bridal events listed on this page you'll find lots of useful wedding suppliers that you'll need for your happy day. 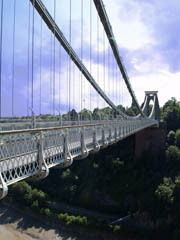 Probably Bristol's most famous landmark - the Clifton Suspension Bridge designed by the engineer Isambard Kingdom Brunel.